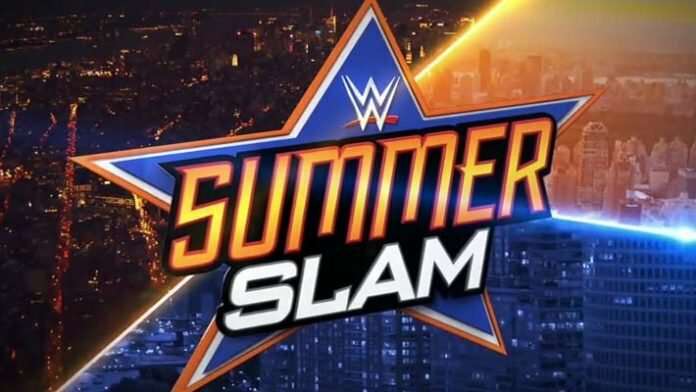 MultiMediaMouth.com is proud to present the Semi-Live Blog of WWE SummerSlam!. Make sure you check back for the results of a Pay-Per-View that will set the course for the fall of WWE TV! We kick off the night with John Cena v. Baron Corbin. Cena goes to the announcer table and tells JBL that Corbin isn’t thinking about tonight, but rather about his failed cash-in from the previous Tuesday night. Corbin takes control of the match pretty early on. Corbin is taking it to Cena but Cena is moving very slowly. Corbin throws Cena into the turnbuckle and follows behind him. Cena then reverses and throws Corbin into the turnbuckles but Corbin slides out and hits a clothesline. Corbin hits a hard Slam on Cena and gets a 2 count. Cena begins to take control of the match but Corbin is able to slow his momentum. Corbin seems to be setting up a superplex out of the corner but Cena escapes and hits a massive DDT. Cena hits a 5-Knuckle-Shuffle then goes for an Attitude Adjustment but Corbin gets out and hits the Deep 6. Cena manages to get out of the line of fire and hits an Attitude Adjustment and gets a pinfall. the match from the onset. Natalya takes over control of the match. The crowd is really heated towards Natalya. Natalya is getting a few two counts and she keeps yelling at the ref to do his job. Natalya is looking really good. She’s is showing what years of experience can do in the ring. Naomi is able to get out of a high-impact move and it’s a neck breaker from the top rope. Naomi gets her first pin attempt. Naomi does her “Glow Time” kicks, Natalya catches her kick making Naomi do a split. Looked very painful. Naomi does an over the top rope leg drop and gets a two count. She shows some frustration. Naomi tries to get a submission locked in but Natalya gets into the sharp shooter. Naomi is able to flip Natalya over and Natalya hits her neck in the turn buckle. Natalya gets Naomi into a sharpshooter and Naomi taps out! Enzo comes out and annoys the crap out of us. Basically, all he was saying is that he’s a better promo than Big Cass. Big Cass finally came out and stopped Enzo. Big Show takes control of the match right out. For a man with a broken hand, he’s using it a lot. Bad Continuity. Show goes for a splash off the middle rope and misses and lands on his hand. Enzo is yelling all sorts of nonsense. Cass began to take apart Show’s hand. Show takes control back from Cass. Show is attempting a chokeslam with his “broken” right hand. Cass gets out of it but hits a chokeslam with his left hand. He gets a two count. Enzo escapes the cage and the minute he got to the ring Cass kicks him in the face. Cass hits the “Empire State Elbow” and gets a three count. Winner via Pinfall: Big Cass. ttacks Randy Orton during Orton’s entrance. It was a brutal attack. The match officially starts and Orton hits an RKO out of nowhere and gets a three count. Winner via Pinfall: Randy Orton. Banks is out first followed by Bliss. Bliss is looking amazing. Sasha starts off with punches in the corner. They go back and forth. Bliss hits a hard right hand to Sasha’s face. Bliss has complete control of the match. Bliss is getting a two count. Sasha is starting to get control until Bliss is able to stop her momentum. Bliss does this amazing flipping double knee. Amazing move. She gets a two count. Bliss is using all of her 5 counts to her advantage. The crowd is into this match. Banks gain some momentum and a two count but Bliss takes control again. Bliss yells at Banks to “Give up” and Banks hits a hard kick. Banks also throws Bliss into the turn buckle. A very hard hit. Banks hits the Bank Statement and Bliss gets to the ropes. Banks follows her out. Banks goes for a double knee and Bliss pulls the ring skirt and Banks falls. Bliss goes into the ring and lets an 8 count go by before Banks slides back in. Bliss goes to the top rope and hits a splash. Banks kicks out and Bliss throws a tantrum. After Bliss finishes her tantrum, Banks hits a bank statement twice and gets Bliss to tap out.